Photo by Christopher Carroll ROCK Photography. Big news in the Vixen camp as the band’s frontwoman Janet Gardner has announced that she is stepping down and allowing the group’s rhythm section — drummer Roxy Petrucci and bassist Share Ross — to continue with their version of the band. Gardner was Vixen‘s lead vocalist from 1983 to 1992, 1997 to 1998, 2001, 2004, and 2012 to 2019. She is considered to be part of Vixen‘s classic line-up with Petrucci, Share and now deceased guitarist and band founder Jan Kuehnemund. Gardner contributed lead vocals on Vixen‘s best known studio albums — Vixen (1988), Rev It Up (1990) and Tangerine (1998) — as well as the group’s recently released live album Live Fire (2018). Gardner has undergone a lot of changes in her life during the last few years marrying guitarist Justin James in 2016, releasing her debut self-titled solo album in 2017 and being rushed to a hospital for emergency surgery with respect to a subdural hematoma in January 2018. 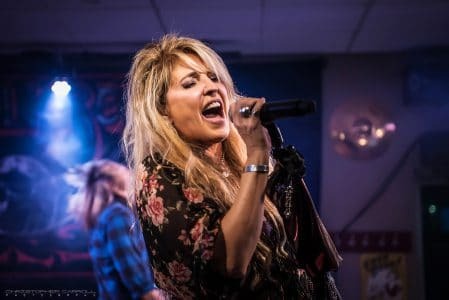 Femme Fatale singer Lorraine Lewis ended up filling for Gardner at a Vixen gig at the Choctaw Casino & Resort in Durant, Oklahoma, USA on March 3, 2018 while Gardner recovered from her surgery. One wonders if Lewis will be the replacement for Gardner going forward. Vixen‘s next live appearance is scheduled for the Monsters of Rock Cruise, which starts on February 24, 2019.